✔ ENCOURAGES HENS TO LAY EGGS IN NESTING BOX — When a broody hen sees other eggs, she identifies that area as a safe place to lay her own eggs. 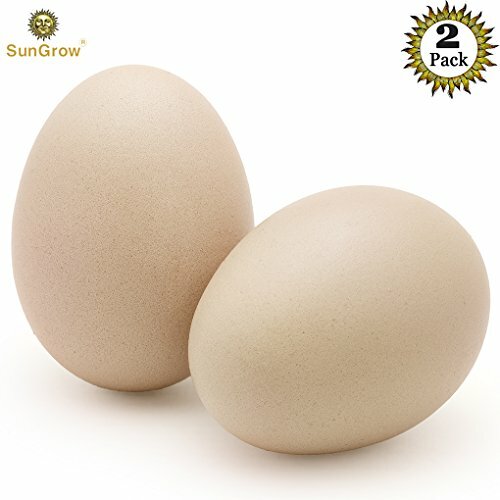 Place these SunGrow ceramic chicken eggs inside the nesting box to encourage hens to lay eggs in a clean, cozy area instead of on the ground or chicken coop floor. ✔ DISCOURAGES BAD HABITS LIKE PECKING — Occasionally chickens may have bad habits such as eating and pecking at eggs in the nest. Before they have a chance to peck at real eggs, place ceramic eggs in the nest box. Chickens will peck at the ceramic and receive no reward which in turn discourages them from pecking at the actual chicken eggs. 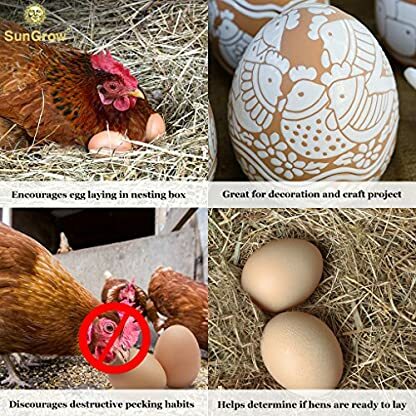 ✔ USE TO TEST BROODINESS IN HENS — If you are unsure whether your hens are broody or not, the 2 pack of SunGrow Ceramic Nest Eggs are an excellent way to find out. Place a couple of the realistic looking eggs in the nesting box and wait to see if your hen sets on them. When she does start setting for 3 days or more, it’s time to replace to fake eggs with fertile eggs to be hatched. Are the ceramic nest eggs safe? Made with durable ceramic material, the artificial nest eggs are 100% safe for you and your chickens. They are actually a great tool in discouraging your chicken from pecking and eating real eggs. The hard ceramic is tough enough to resist their beaks eventually making them lose any interest in eggs, fake or real. The SunGrow Ceramic Chicken Eggs are a natural slight reddish-brown color, approximately 2.75″ (7cm) in size and come in a secure plastic pack of two. Why should I add these eggs to my chicken coop? Placing several ceramic nest eggs in your chicken hutch has many benefits to you and your chickens. They are often used to test for broodiness in hens by watching to see if hens are setting on the eggs indicating that they are ready to set on fertile eggs. Ceramic chicken eggs can also be used to break bad habits such as laying eggs in the middle of the coop floor instead of the nesting box. Are there any other interesting uses for these eggs? There are many fun and useful purposes for the ceramic eggs besides adding them to a chicken coop. The charming, natural look and feel make them an excellent choice for so many arts, crafts and do-it-yourself home decor. Combine the eggs with pretty branches around a candle to create a unique centerpiece for a country-themed party or interior design. Use special ceramic paint markers to decorate the eggs and set them around the house for colorful Easter decorations. 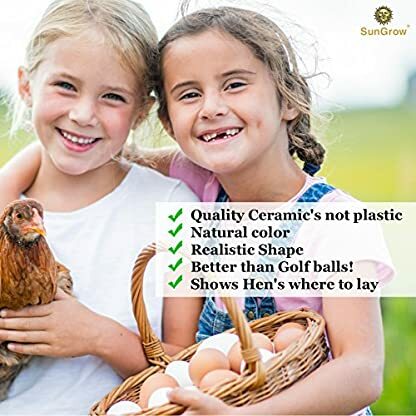 ✔ NATURALLY SIZED AND COLORED — Approximately 2.75″ (7cm) in size, the ceramic eggs from SunGrow are designed to closely replicate actual chicken eggs. Natural chicken eggs vary in color; this particular pair of ceramic nest eggs are a light brown color with a hint of red for authenticity. 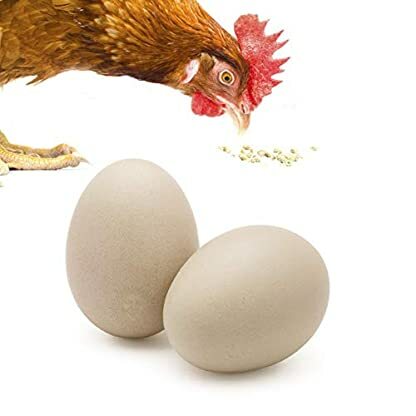 ✔ MAKES BEAUTIFUL DIY HOME DECOR — Along with being an effective and practical addition to your chicken coop, the durable ceramic chicken eggs look beautiful when used in do it yourself home decor. The raw, organic appearance of these durable eggs is perfect for festival like easter or traditional interior designs, log cabins, farmhouses, and country-themed homes.